Away from the Magnificent Mile’s undeniably impressive collection of the world’s leading department stores and recognizable luxury brands, Chicago has many unique women’s boutiques selling everything from quirky vintage to upscale fashion, all in equally elegant spaces. Stocking cool, contemporary designers from across the globe and run by some of the city’s most stylish people, these are the destinations to remember the next time you need a new outfit (or even if you don’t!). Old Town’s Handle with Care has a long history, dating all the way back to 1981 when it opened as a gift boutique. Current owner Brinton Coxe took over the two-room store nearly a decade ago and evolved it to meet the needs of its customers, offering one of the city’s best selections of moderately priced designer luxury, as well as budget-friendly casual, everyday garments. The layout helpfully separates the expensive designer ware from the more affordable options. Ross Kelly and Sasha Hodges opened Kokorokoko in 2009 after spending years collecting clothing, accessories, and housewares from the ’80s and ’90s. It’s filled with bright, funky, and unique vintage pieces, from retro sportswear and band t-shirts to a large selection of cowboy boots, quirky jewelry, and new designer accessories. All items are under $100 and there are many bargains to be found, so stop by the next time you’re in Wicker Park. Staying with vintage on North Milwaukee, Una Mae’s has a range of affordable, vintage women’s clothing and accessories (and men’s too) alongside the coolest contemporary brands. The ground floor selection is chic and stylish, while the second floor is one of the best places in the city to find a unique vintage piece. Known for their extensive jewelry range, they’ve also expanded with a home and apothecary section, selling quality bath and body products, and more. 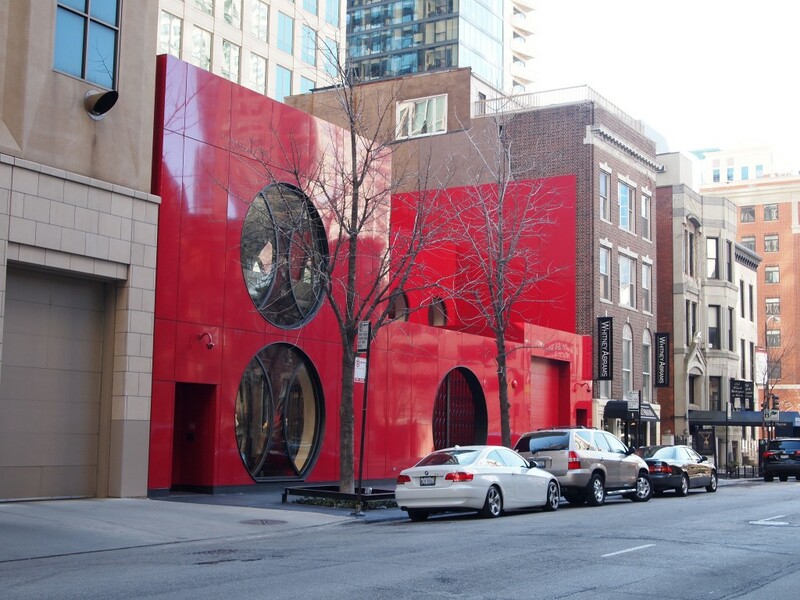 Unmissable with its arrestingly flamboyant red exterior, this huge, upscale boutique was opened by Ikram Goldman in 2011. Famous for dressing Michelle Obama for the inauguration in 2009, Ikram is fashion royalty in Chicago, and her boutique has unique selections of sophisticated clothing, shoes, and other accessories from American, European, and Japanese designers, as well as vintage pieces hand-picked by the lady herself. Need a break from shopping? There’s also a cafe and an art gallery inside the 16,000-square-foot store. Another high-end boutique named for its founder and owner, Robin Richman in Bucktown may look relatively low-key from the outside, but inside it has a decor as stylish as the products for sale, with its clothing and accessories displayed among pieces of art in a minimalist, gallery style. Stocking expensive one-of-a-kind pieces from exclusive designers might mean high prices, but the staff is warm and friendly to all. Also in Old Town is Adelaide, which, in spite of its name, specializes in imported European fashion and is committed to “enduring beauty, progressive vision, and timeless sophistication.” With the chic design of its store featuring elegant chandeliers and exposed brick walls, browsing its ever-evolving luxury collections of clothing, handbags, jewelry, and shoes is a wonderful shopping experience. Adelaide’s quality has been recognized by Forbes Travel Guide and Culture Mix Magazine. Moon Voyage was opened in 2012 by Chicago-bred Susie Lee, and she describes it as “an edgy New Yorker meets a laid-back Californian.” To be found near the intersection of Milwaukee, North, and Damen in Wicker Park, Moon Voyager stocks on-trend apparel and jewelry by small- to mid-tier designers, as well as accessories, specialty lingerie, apothecary, and homeware. The staff also shares its expertise on its fashion and beauty blog, Voyager. Further along Damen, p.45 has been a fixture in Bucktown since Tricia Tunstall opened it in 1997 as one of the first boutiques in the emerging neighborhood. It has since been featured in Vogue, Elle, and Glamour, and although it predates most of its contemporaries, it often remains one step ahead with an eclectic range featuring Chicago designers Sarah McGuire and Anna Brown, among many others. Everything here is presented in an elegant, minimalist space, and the staff is famously welcoming and helpful. Squasht was founded in October 2004 by St. Louis native Lesley Timpe and opened its first shop in Ukrainian Village in 2010. As well as offering work by other independent designers, the folks at Squasht design and create their own seasonal lines of dresses, skirts, tops, tunics, headbands, and their signature reversible hats. Timpe was named “Best Local Clothing Designer” in 2013 and 2014 in the Chicago Reader’s “Best of Chicago” Readers’ Polls and is on hand to help you find what you’re looking for.